Enjoy fresh basil ’til next season. 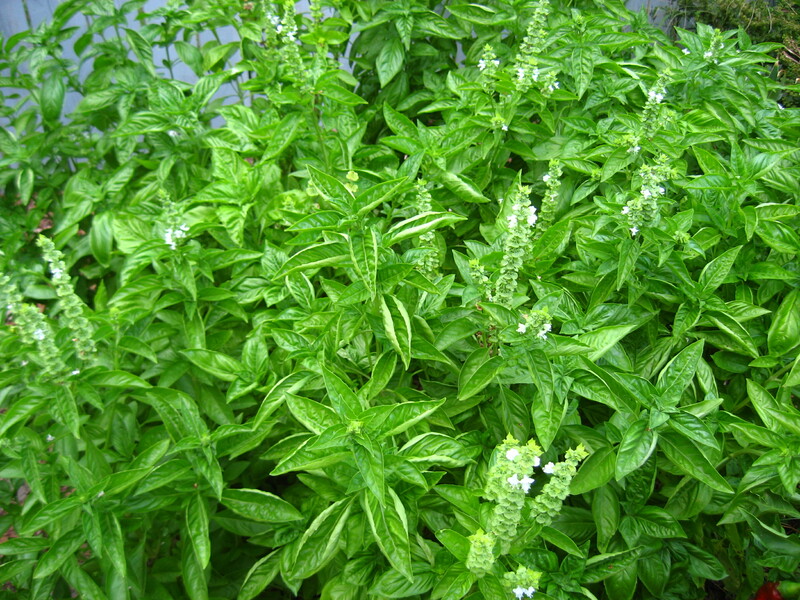 Basil is very easy to grow in the midwest and throughout most of the country. I have tried lots of varieties: purple, cinnamon, Thai, lemon and sweet Genoese . The Genoese is still my favorite. To me, dried basil has never held a match stick, let alone a candle, to fresh basil flavor. I plant 3 rows about 3 feet long and about a foot apart. When the first shoots put on their true leaves you can thin them and use the thinnings in your cooking to get the first fresh basil of the season. It grows quickly. Cut it back and use it for pesto, sauces, etc. It will branch and grow out again and again. When you have time, start putting it up like this. Cut back the basil till you have about a regular paper grocery sack full. Bring it into your kitchen. Fill your sink the cold water until its about 2/3 full. Strip the leaves off the plants. Don’t use flowers or stems. Discard any damaged or discolored leaves. Drop the good leaves into the sink water. Keep going until you have stripped all that you harvested. Make sure all the leaves get a nice “bath”. Drain the water and refill if you feel that they need a second rinse. Usually one is enough. Using a salad spinner, fill the spinner bowl with clean leaves and spin well. Place spun leaves in a large bowl. Food processor, lemon juice, good olive oil. In the processor place 2 cups of washed basil leaves, 1/2 cup olive oil and 1 Tbs lemon juice. Process until smooth. It should be about as thick as plain yogurt. Transfer the “basil slurry” into 1/2 pint freezer jars. Leave a 1/4 inch head space. Wipe lids and cap. Label and put in the freezer. This will keep for at least a year in your freezer. Thaw before using. The thawed “slurry” will keep in your frig for about a month. Use it measure for measure in sauces and soups, or anytime you want that bright summertime flavor. You can also make your favorite pesto recipe in the processor, just don’t add the cheese and freeze it as above.